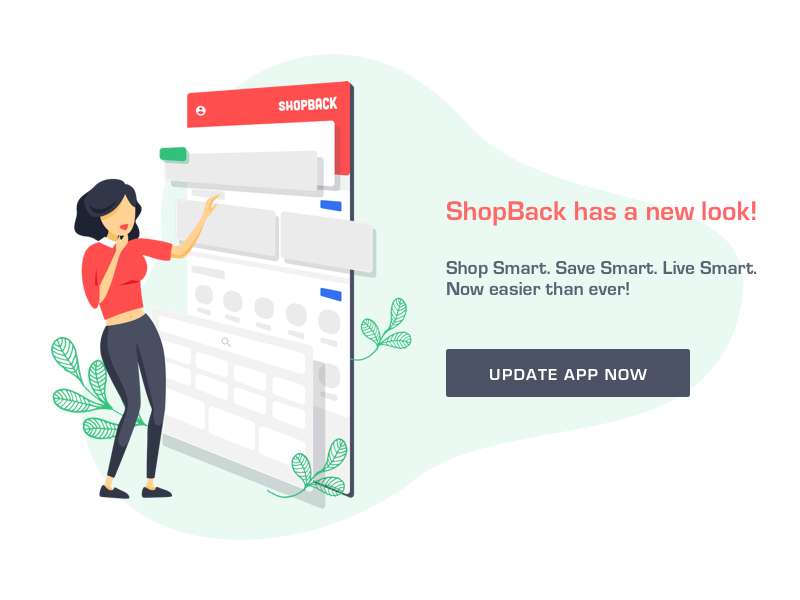 ShopBack has a new look! We just revamped the ShopBack App. The new app has a new architecture that would power us to cater for greater needs in future. Lot's of good things to come! Woohoo! Using humble, friendly message, simple and light illustration to communicate to our users. Category icons used in our mobile app. We minimalized the styles and shapes so that they are easily recognizable when placed 5 in one row on the mobile screen. An old prototype for app onboarding and signup login. The goal of each revamp of onboarding flow is to ease the education learning curve and accelerate signup journey without compromising on trust building. We had made efforts to simplify both feature walkthrough and signup/login flow. A while ago we tried something different for app onboarding. Rather than the traditional horizontal swipable feature walkthrough, which requires multiple tapping to go through, we simplified the interaction with this animated logo display, and one tap to "Get Started". Playing with old unused illustrations. - App: ShopBack mobile app creates a seamless experience for you to shop with Cashback on the go. Available on iOS and Android. - Extension: ShopBack Buddy is the browser extension that reminds you to use ShopBack when you shop online. Never worry about missing a good deal. 1. Have some graphic that makes the situation less disappointing. Talk with a fun personality if you can. 2. Avoid user-unfriendly words like " cannot" "unable" "fail 😱" "error 😱" "wrong 😱" . 3. Be reasonable. Explain possible reasons. 4. Be helpful. Suggest solutions. 5. Be straightforward. Give one and only one button that most likely can get out from here. Trying to convince people to update their app without revealing too much or sounding like a sales person. Mockup for a web project that I did a while ago. It was not used though. To create a simple, flat style, light colors and less graphic elements are used. Hi friends. Togo is a food delivery app that encourages everyone to deliver and order. More details about the app is here. This flow demonstrates how you can receive order to deliver. Hi friends. Togo is a food delivery app that connect encourage everyone to deliver and order. More details about the app is here. This flow demonstrates how you can discover a shop and place order.